One of the newest trends that has taken the dessert world by storm is mochi. It can essentially be paired with mostly anything, both culinary and confectionary. Still, while it continues to soar in its popularity, many wonder and beg the question, “what is mochi?”. Mochi is simply a Japanese delicacy that is created from sweet rice which is pounded until it becomes a paste. This paste is then molded into the desired shape and baked. After it has baked, it is left to cool for hours. In order to ensure that it maintains its texture, it has to be covered with plastic wrap so it does not oxidize which can alter the entire texture. It is then powdered, usually with a rice or potato starch into to avoid the pieces from sticking together. The popularity of mochi ultimately comes from its very distinctive texture. It is soft, chewy, and gelatinous, which oddly resembles similar qualities of a marshmallow. 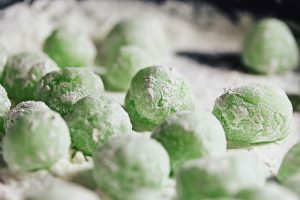 But the mochi can be used as a dumpling in a savory soup or as a dessert like being wrapped around a scoop of ice cream. I find it to be extremely delicious in that the flavor and texture that it has cannot be found in any other confection. It has a mild sweetness to it so it can be paired with other desserts without making the entire dessert too sweet. It can be paired with ice cream or frozen yogurt and can even be stuffed with an array of different fillings. 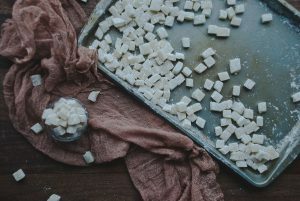 Unlike most trendy desserts, mochi is fairly easy to make in that it does not have many ingredients and the steps involved are not too complex. Preheat oven to 275° F. Line a 9- by 13-inch glass baking dish with parchment paper. (Note: A 9- by 13-inch dish will yield a thin layer of mochi, only about 1/4-inch thick. For thicker mochi, use a 9- by 9-inch glass dish and bake for longer, about 90 minutes.) In a large bowl, whisk together the mochiko, sugar, and baking powder. In a separate bowl, whisk together the water and coconut milk. (Note: Be sure to use full-fat coconut milk. You can usually find it in cans, and it should be quite thick.) Add the wet ingredients to the dry and whisk until the mixture is smooth and no lumps remain. Unlike most baking, you don’t need to worry about over-mixing the ingredients, since mochi is dense and chewy to begin with. So whisk away! Some recipes even call for mixing all the ingredients, dry and wet, in a food processor all at once, and call it a day. Pour the mixture into your lined baking dish. Cover with foil and bake for 60 minutes. The mochi is done when it is soft and gelatinous but holds its shape when touched. (NOTE: A few people have reported that their mochi did not set. A few notes on softer mochi — using low-fat coconut milk may result in a softer consistency. You may also want to check your oven to make sure it’s at the right temperature. Also, if you want extra insurance, you can add another 1/4 cup mochiko flour to the dry ingredients, which should result in significantly firmer mochi., If you’ve already baked it for an hour and it doesn’t appear to be set, raise the temperature to 300° F and remove the foil. Bake for an additional 10-15 minutes, uncovered. Also, note that even if it’s soft and gel-like when it first comes out of the oven, the mochi will set as it cools.) Let cool completely or overnight. Dust a surface with your starch (alternatively, you can simply use more mochiko flour) and turn the mochi onto the surface. Sprinkle starch over the mochi. Wrap a knife in Saran wrap to prevent the mochi sticking. Using the wrapped knife, cut the mochi into small pieces, then dust again with starch or flour, and serve! This entry was posted in Brianna and tagged dessert, Food, sweet by briannavasquez. Bookmark the permalink.